If your front load washing machine is experiencing wet clothes after washing, washer is vibrating, longer wash cycle times, washer stops and pauses, or door stays locked? 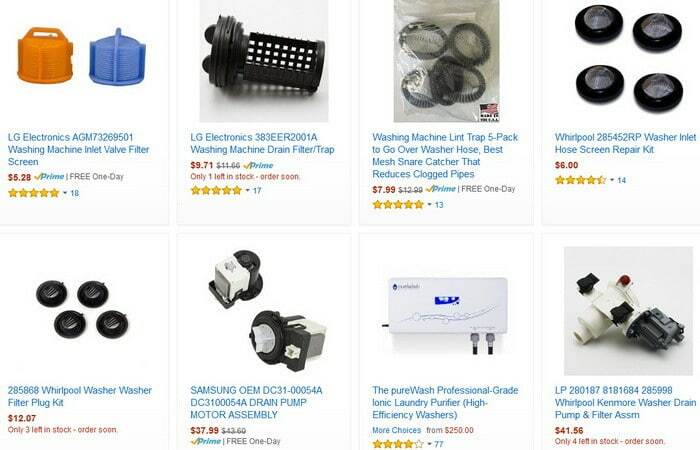 You most likely have a clogged drain pump filter. Over time small items in your washer will fall down into the drain system and get trapped in the filter. 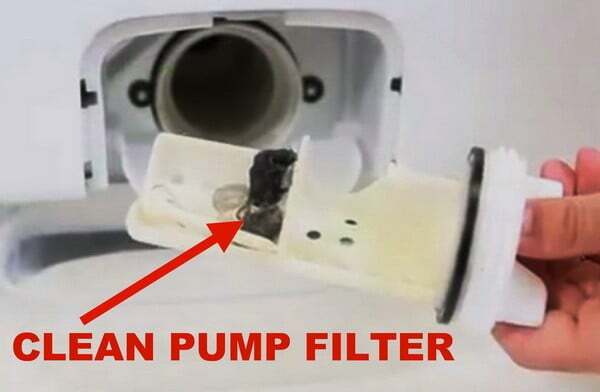 This filter is a part of your front load washer so small items like lint, dog hair, coins, and keys do not find a way into the drain pump filter (aka coin trap). The filter on a front loading washing machine is located on the front of the machine on the bottom and the right side or left side. The filter needs to be cleaned and maintained. Cleaning it on a regular basis will avoid any future problems with your washer having operational issues. 1 – Locate and open the small access door using a flat screwdriver or coin. 2 – Get a small bowl and towel and put under the door. 3 – Turn the filter counter clockwise to remove it. 4 – Let all the water drain out into the bowl or towel. 5 – Clean out any link, dog hair, or other gunk in or around the filter. 6 – Run the filter under hot water in your sink to clean it off. 7 – Clean where the filter slides into with a warm rag or dishcloth. 8 – Reinstall the filter and turn clockwise to lock it in place. 9 – Close the small access door. Now, test your washer by doing a normal load of clothing on a normal wash cycle. You should notice that your clothes are not wet, the washer is not vibrating, the wash time is shorter, the washer does not pause and stop, and the door will not lock. If after cleaning the drain pump filter you experience the same problems with your washer, it may be washer out of balance. Make sure you are not overloading your washer or letting large items become unevenly distributed in the wash drum. Most front load washers sense when you have an unbalanced load. Your washer will try and compensate for this by washing longer or pausing and stopping. Small loads like one pairs of jeans may also be seen as an unbalance. Always have enough clothing in your washer to keep things “even” so the washer does not sense an imbalance. Remember to always remove items from pockets of clothing before putting into the wash machine. Doing this will prevent any other foreign objects from getting into the pump filter. Keeping the filter clean is the best way to prevent the washer from experiencing wet clothing after washing, washer that vibrates, long wash cycle times, washer stops and pauses, or the door stays locked. Note: This only applies to front loading washing machines as older style top loading washers do not have a drain pump filter. 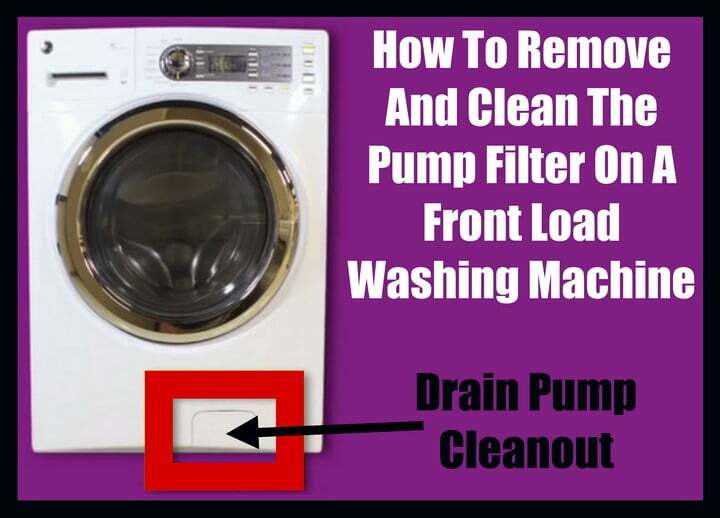 If you know of other ways a washer will have the issues mentioned above but it is not from a clogged drain pump filter, please leave a comment below to assist others. I did this and it worked perfect. However, when I first started having the problem I was lead to believe it was the “Spider”. I ended up rebuilding my washer for about $300. I was disappointed when it still shook and the water would not drain. The spider was absolutely destroyed so needed it, but it was not running right after putting it back together. I ran across this video when I noted the code on the washer, I did this 2 minute solution and it works great. I will always wonder if it was simply this. New Electrolux machines don’t have an access​ panel which means you have to take the machine apart for regular maintenance. Same thing applies for many top brands. Very bad idea and quite disappointing. I am shopping for a new machine and I googled but nowhere can I find the answer.. Most front loading washers don’t have a filter access panel anymore. They have a filter but you need to take the entire machine apart to do what seems to me standard maintenance if you want to have the washer for 15+ years. The question is.. Why are access panels non-existent for most new washers? Are they useless? Is there no actual need to have access to coins/junk that might go down the drain? Do the machines have a pre-filter thing going on that coins/junk won’t go down in the first place? I have tried the the measures above and I still not able to operate the machine. I have drained the system and checked the filter and the balance of the machine. No luck! We are having the same problem…did you ever find out what the issue was? No small panel on front lower section? Discharge hose comes out at top left part of washer. No filter panel? I have tried the the measures above and I still not able to operate the machine. I have drained the system and checked the filter and the balance of the machine. No luck! I have a Samsung model WF330ANWXAA02.